Click here for capacitor questions and homework. A capacitor is a charge storage device. 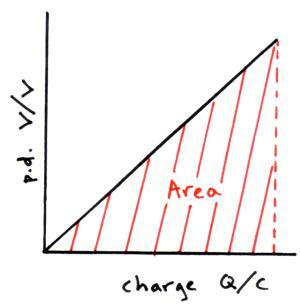 Charges (Q) are measure in coulombs (C). A single electron carries a charge of 1.6 x 10-19 C.
A capacitor is two metal plates separated by an insulator (or dielectric). The capacitance of a capacitor is measured in farads (F). One farad is one coulomb of charge per volt (1 F = 1 CV-1). 1 farad is a a very large capacitance. Typically capacitors have a capacitance around the micro farad (10-6F), nano farad (10-9F), pico farad (10-12 F) sizes. The charge (Q) stored on a capacitor is directly proportional to the potential difference (V) across the plates of the capacitor. The area underneath the line on the graph is equal to the energy (E) stored on the capacitor measured in joules (J). 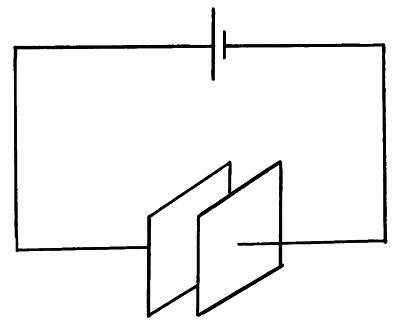 As the capacitor discharges the electrons from the negative (-) plate flow to the positive (+) plate of the capacitor and a current flows in the circuit. 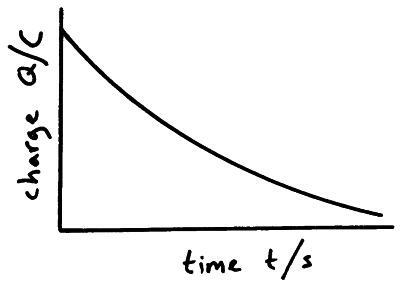 The graph below shows the exponential decay curve when charge is plotted against time for a discharging capacitor. 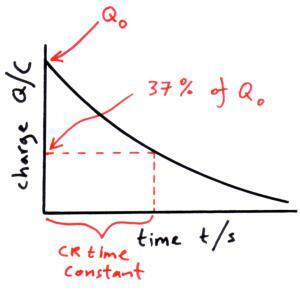 The CR time constant gives us an indication of how quickly the capacitor will discharge. If the CR time constant is large the capacitor will take a greater time to discharge than if the CR time constant is small. The time constant is equal to the time it takes for the charge on a capacitor to reach 1/e (37 %) of its initial value. We can find a value for the CR time constant from a graph.